The glossy orange-red berries of the rosehip are the fruit of our hedgerow rose, and a sure sign of autumn turning to winter. 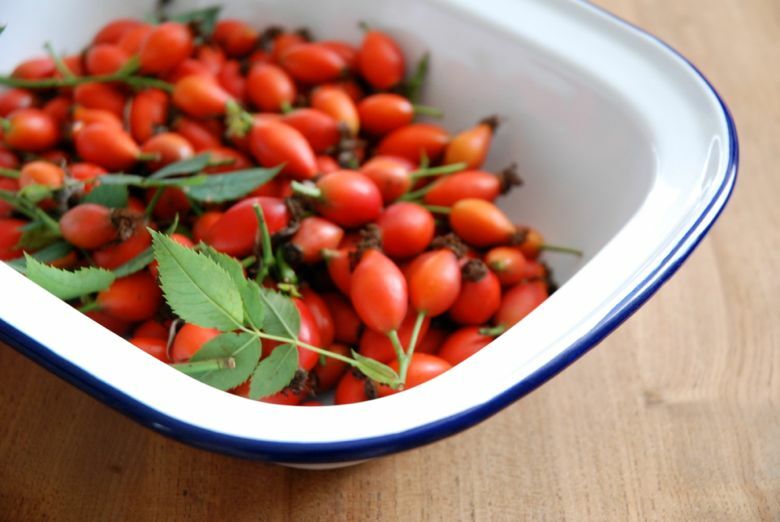 Rosehips are rich in vitamin A and C and can be used to make syrup, jams, jellies and tea. During the second world war, volunteers were paid just over a penny for each pound of rosehips they collected. 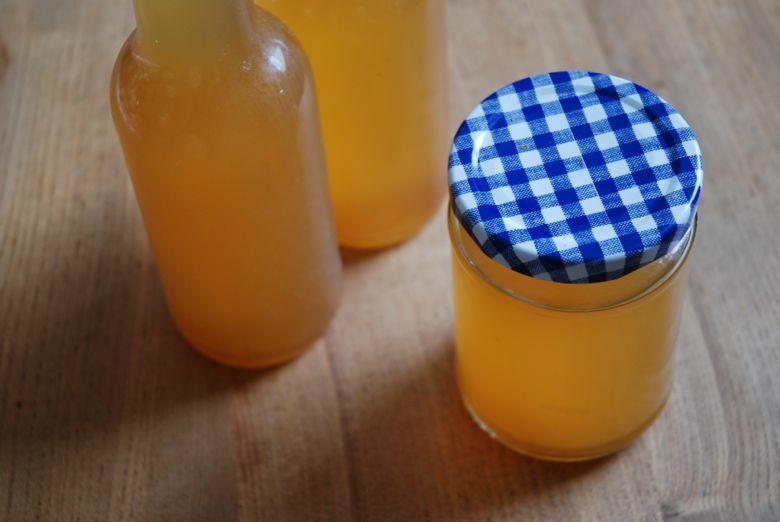 The resulting syrup was fed to the nation's children, to boost their intake of vitamin C.
This syrup can be drizzled on rice pudding or pancakes, or can be added to water as a cordial or mixed with hot water for a warming winter drink. Rosehip syrup - makes about 750ml. Remove the stalks and rinse the rosehips in cold water. Put 400ml water in a pan and bring to the boil. Meanwhile chop the rosehips in a food processor. Add the rosehips to the boiling water, cover and bring back to the boil. Take of the heat and leave to stand for 15 minutes. 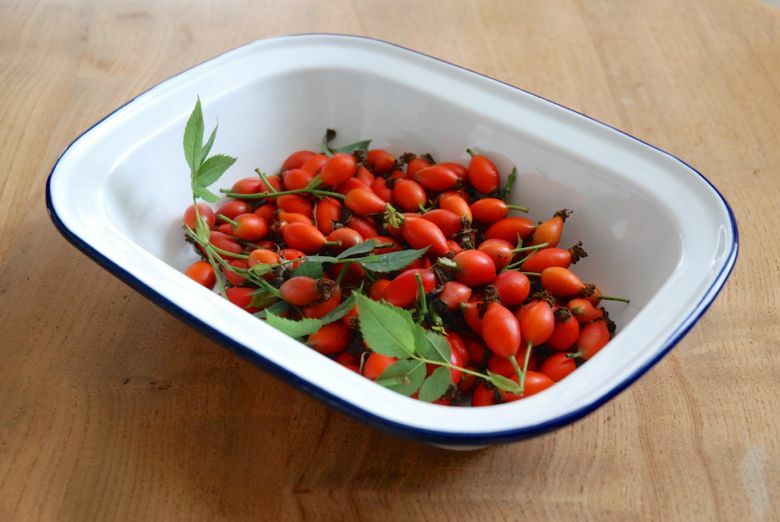 Place a muslin covered sieve over a bowl and pour over the rosehip mixture. Leave to drip for an hour. Bring another 400ml water to the boil, add the rosehip pulp and repeat the boiling process. Tip the pulp back into the muslin covered sieve and leave to drip overnight. The next day, preheat the oven to gas mark 1 and sterilise the bottles by washing in hot water and leaving in the oven to dry. Discard the rosehip pulp. Pour the strained juice into a saucepan and add the sugar. Stir until dissolved. Boil for 2-3 minutes and then pour into your sterilised bottles. Use within 4 months. Recipe from River Cottage Handbook No. 2: Preserves. I too have never had any - very tempted to try it out though! I didn't even know you could eat rosehip!!! I'd love to taste it! What a great way to use them, and drizzled on pancakes sounds wonderful!